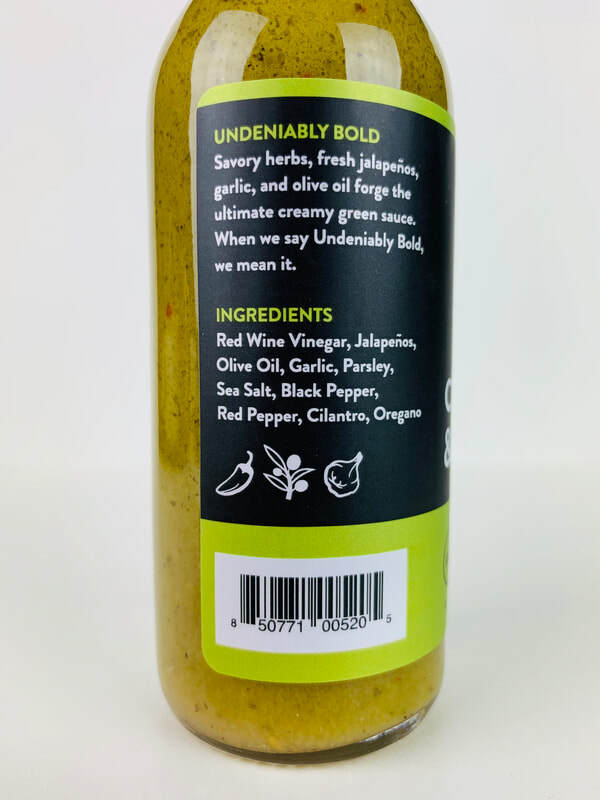 ​Their mission is to craft incredible hot sauces and seasonings that are undeniably bold and delicious. To focus on culinary alchemy, combining heat and flavor in new and exciting ways. ​Their passion is their customers and wowing them with products that are unlike anything else out there. 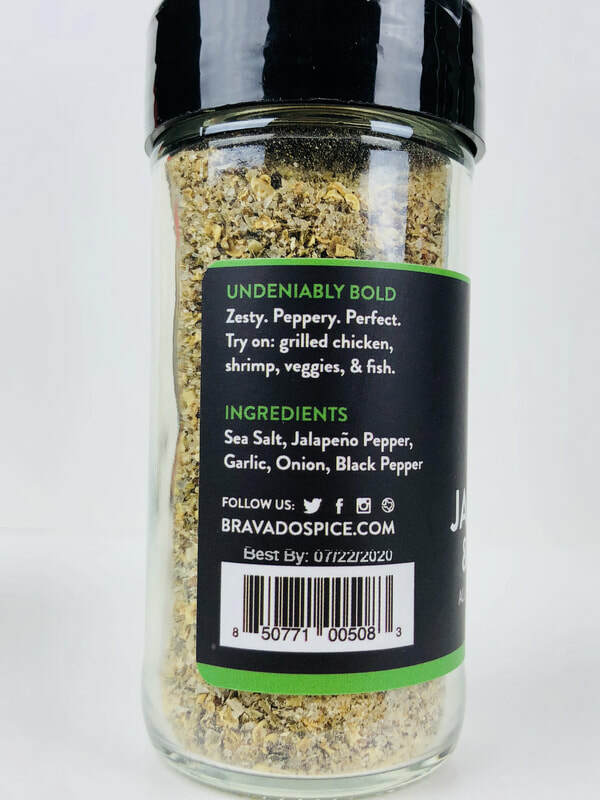 SEE ALL ABOUT BRAVADO SPICE CO. BY CLICKING HERE! CREAMY HERB & JALAPEÑO from BRAVADO SPICE CO.. The name says it all, Its CREAMY, has an amazing HERB flavor and the taste and heat of the JALAPEÑO pepper! I can't express in words just how creamy this sauce is, Its perfect! Every drop of this sauce is a full flavor of garlic, parsley, black pepper, fresh tasting cilantro and oregano. Then the great taste of the jalapeño to add the kick this sauce deliveries. 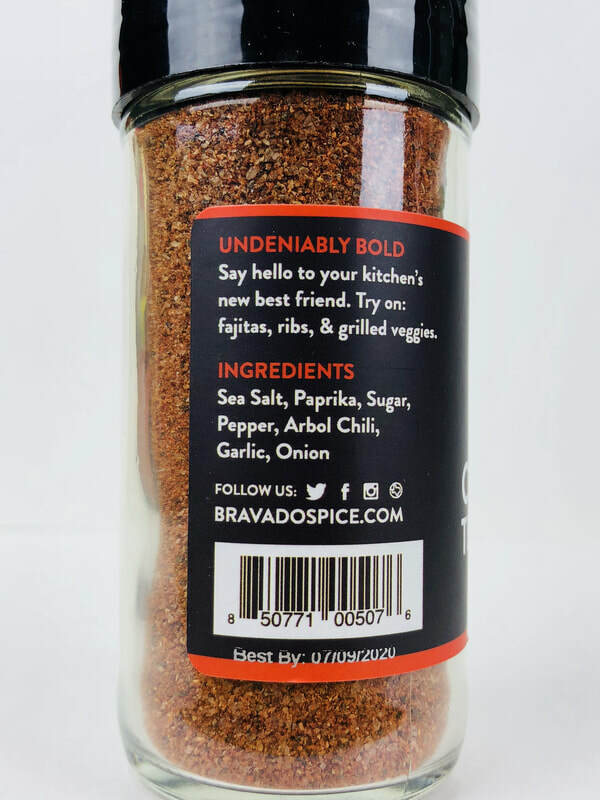 Fantastic job goes to the BRAVADO SPICE CO. for keep making new and exciting products. Pour this over any dish to add the amazing flavor of herbs. spaghetti, pizza, eggs, roast beef, soups, salads and more. 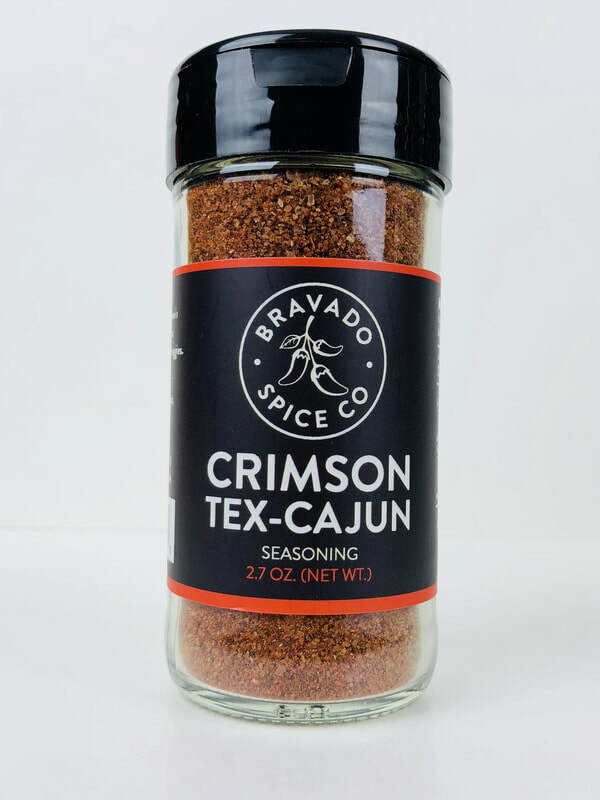 CRIMSON TEX-CAJUN from BRAVADO SPICE CO.. New from Bravado Spice Co., the makers of amazing hot sauces and more, comes their new line of flavored salts. Crimson has NOW BEEN MADE EVEN BETTER. (as if that could happen! But they did it and I love this seasoning even better then before!) a mixture of salt, paprika, black pepper, Arbol chili, garlic and a hint of sugar. But remember these are flavored salts not just seasonings. Use them in place of your table salt to bring out a new dimension of flavor to all of your favorite foods. This will leave just a little sting on your tongue but nothing anyone can't handle. We used this on fries, pop corn and even on our burger. I'm really loving these. NOW IN A STAY FRESH GLASS JAR! 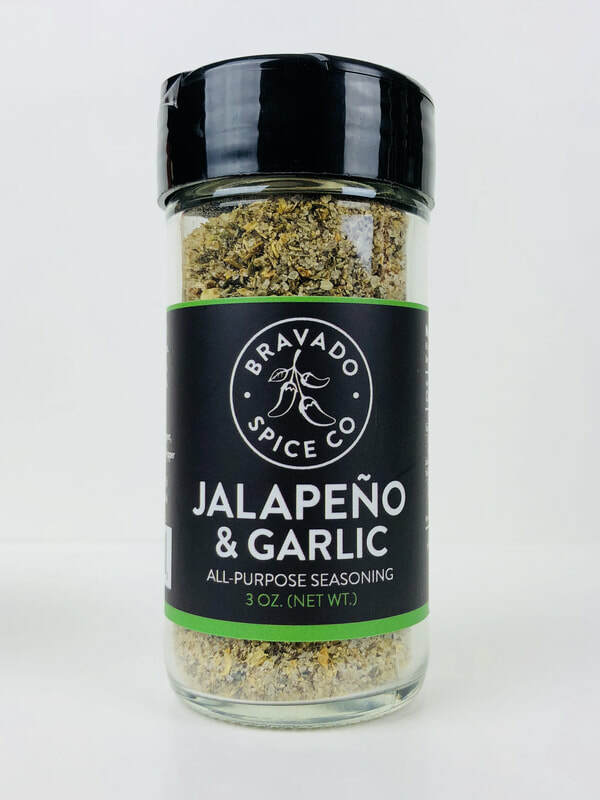 JALAPENO & GARLIC from BRAVADO SPICE CO... Throw out your table salt and replace it with one of these! The Jalapeno & Garlic does not disappoint with the perfect mixture of jalapeno, garlic, onion and black pepper with just a little heat. My wife knew I was hooked on these because I didn't use any ketchup on my fries. (thats a first!). Use a pinch on both sides of your pork chops, chicken, fish or steak before or after cooking. Use in soups, stews, vegitables, fries or on the rim of your bloody marry. You will definitely love them as much as we do! ​NOW IN A STAY FRESH GLASS JAR! 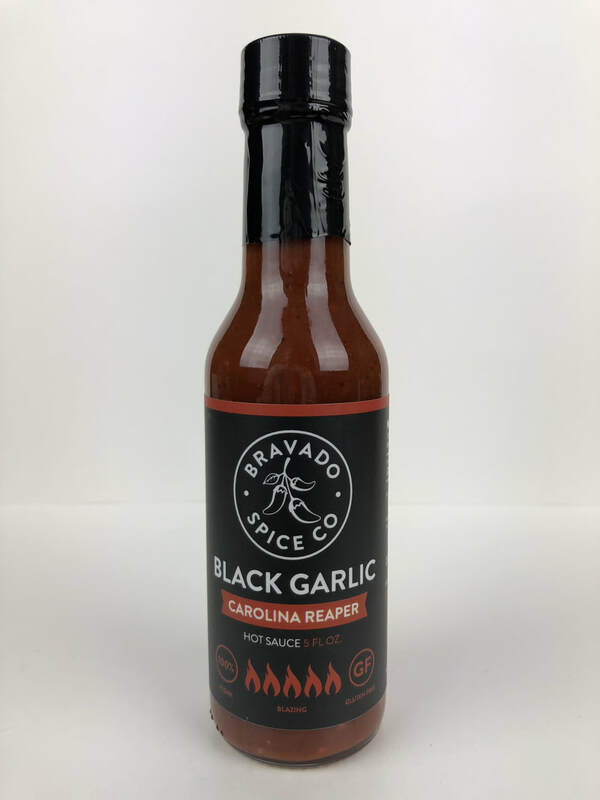 BLACK GARLIC from BRAVADO SPICE CO... Bravado spice just can't be ignored! 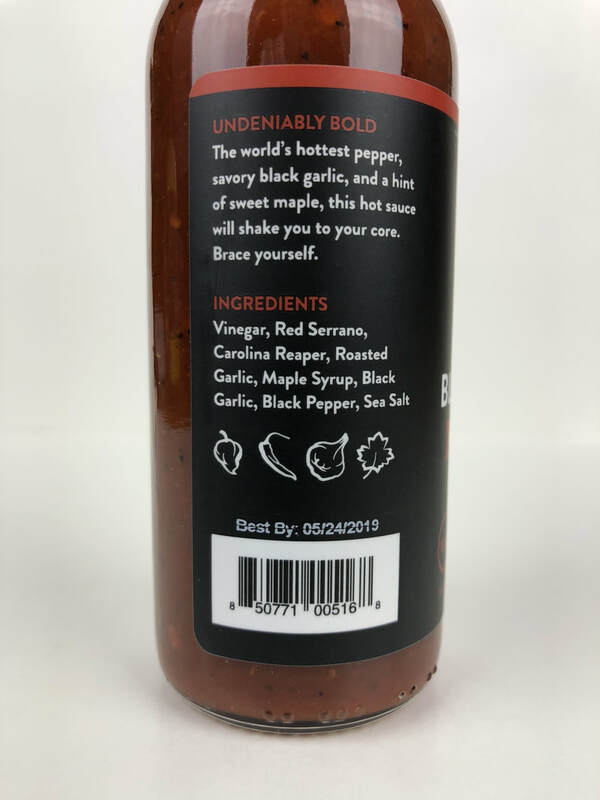 You will see this sauce on the next season of the HOT ONES. I'm sure this will be a hit in Sean's line up. ​ The red serrano is up front followed by the flavor and heat of the Carolina reaper. Then the Roasted and Black garlic rolls across your taste buds in perfect harmony and perfection. A hit of black pepper is present with a slight flavoring from maple syrup that will follow in the background. 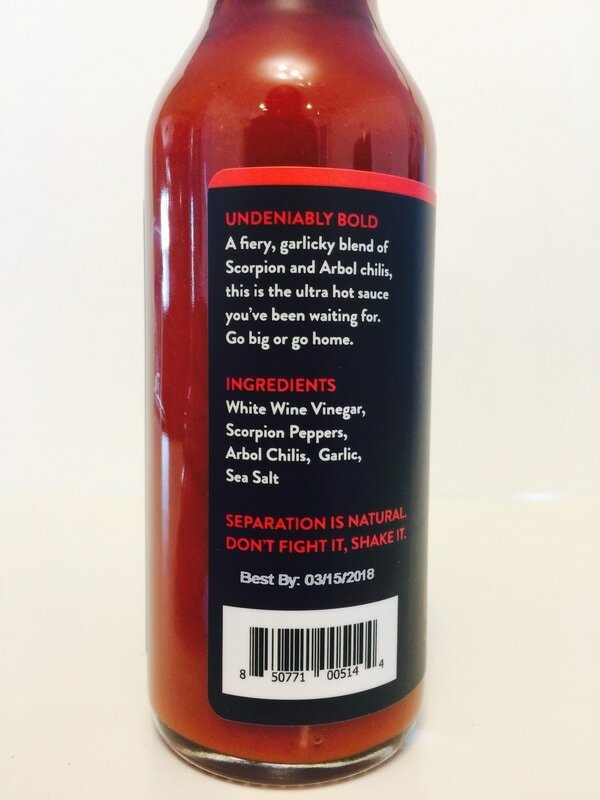 At this time this delicious hot sauce can only be purchased at Heatonist.com. Make sure you get yours! Great with anything! I used this on fish tacos, wings and eggs. So looking forward to pouring this on my next meal! Once again a FANTASTIC job coming from Bravado Spice! 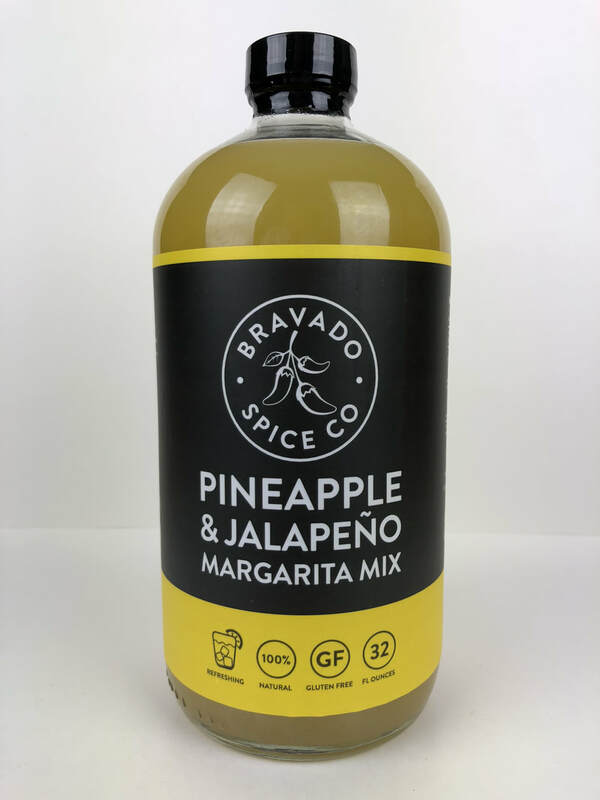 PINEAPPLE & JALAPEÑO MARGARITA MIX from BRAVADO SPICE CO... ​ The mixture of the very fresh tasting pineapple juice, lime, sugar and jalapeño is spot on! From first taste I was gulping it down like a dog after a long hot summer run. I would have never thought of the flavor of jalapeño and pineapple would be so refreshing together. (Thank you Bravado for your culinary genius) If you want a totally different tasting margarita, then this is it. Fantastic! 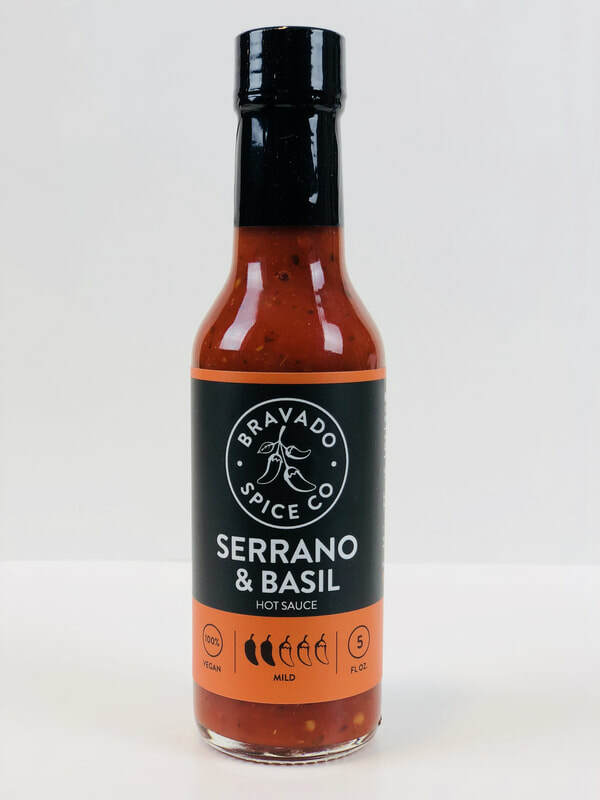 SERRANO & BASIL from BRAVADO SPICE CO... As much as I love all of the Bravado products, I think this is their best tasting and all around useful sauce to date. 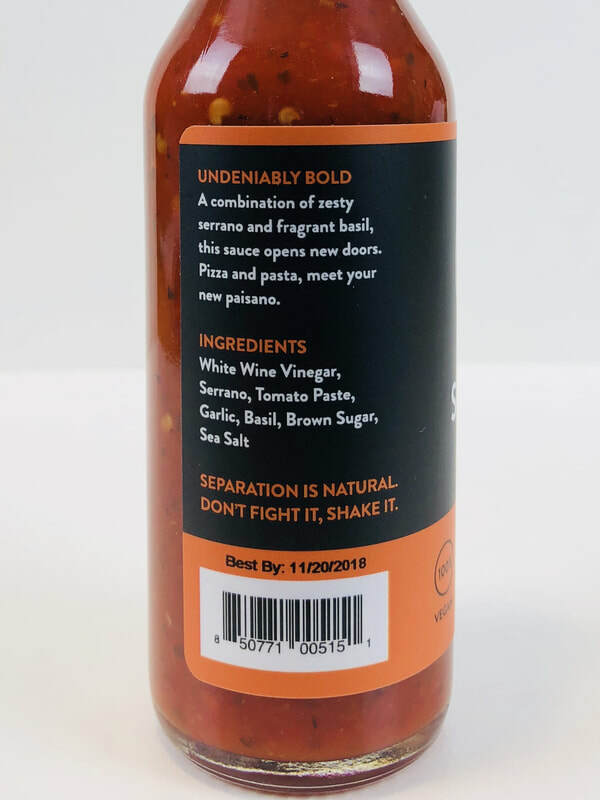 It has a combined flavoring of a Sriracha style hot sauce (without having a fermented pepper flavor) with fresh basil, garlic, tomato, brown sugar and salt. The Serrano peppers burst with flavor to make this sauce come alive with every drop. This is a true all around hot sauce that you can used on all types of foods including breakfast, lunch and dinner. All the flavors and heat are balanced perfectly. We used this on stuffed peppers and the flavor it added was out of this world! This is definitely a winner! 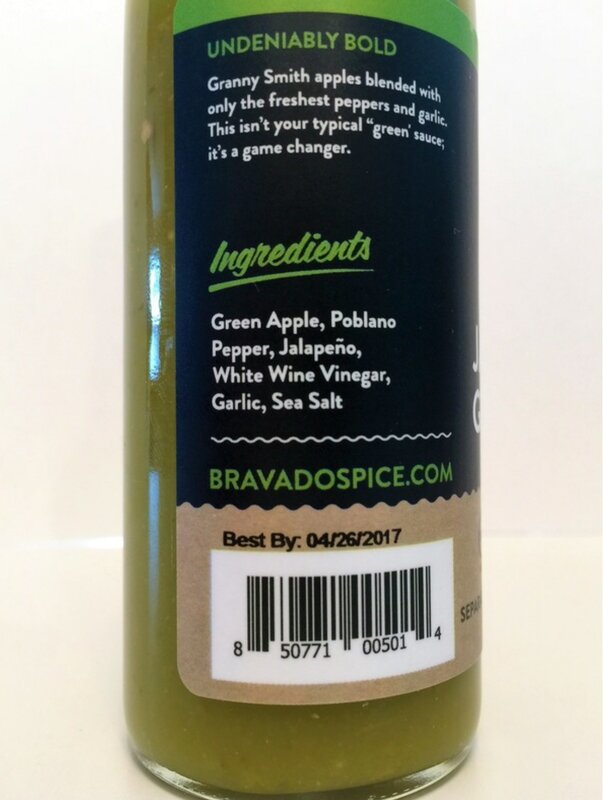 I'm truly loving Serrano and Basil from Bravado Spice Co. Think of it as an Italian Sriracha Sauce! 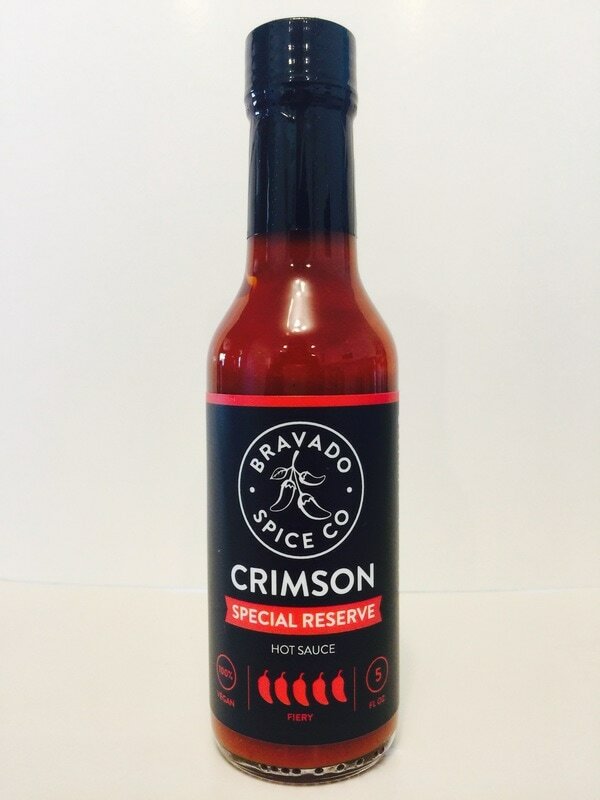 CRIMSON SPECIAL RESERVE from BRAVADO SPICE CO... New from Bravado Spice Co., a spicier spin to their original Crimson sauce. If you love the original flavor of Crimson and wanted a little more heat, this is it! The addition of scorpion pepper adds a lot more heat, but it also brings the extra flavor of the scorpion to the forefront. You will still get the great flavor of the arbol chili pepper and garlic with a little more white vinegar to smooth out the bite of the scorpion. This is a fantastic table sauce that will go great on anything from pizza, eggs, chicken, fish, breakfast, Mexican style food or whatever you like to add heat and outstanding flavor to. 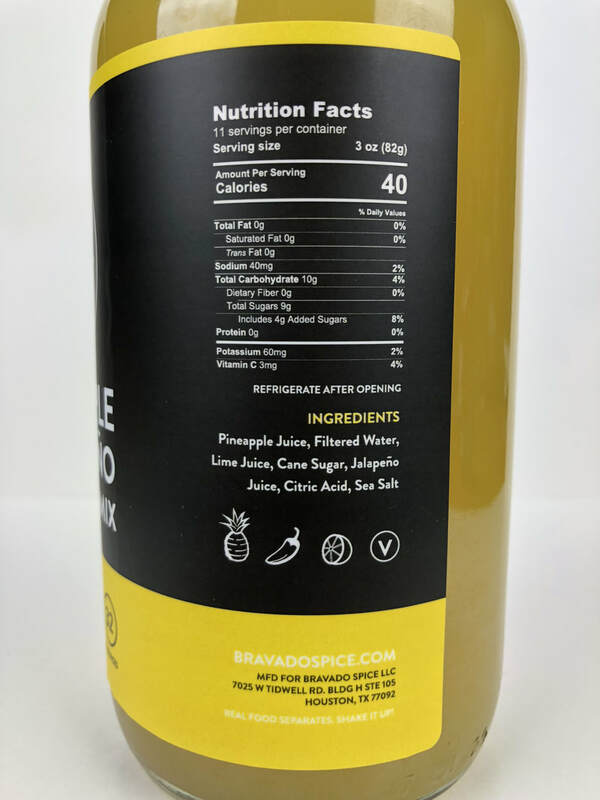 Be sure to go to www.Bravadospice.com to see all their fantastic recipe videos that show you how to make some amazing dishes using all of the Bravado Spice Co. products. CRIMSON HAS BEEN RE-RELASED TO BE A SMOTHER TEXTURED SAUCE WITH THE SAME GREAT FLAVOR YOU HAVE COME TO LOVE! 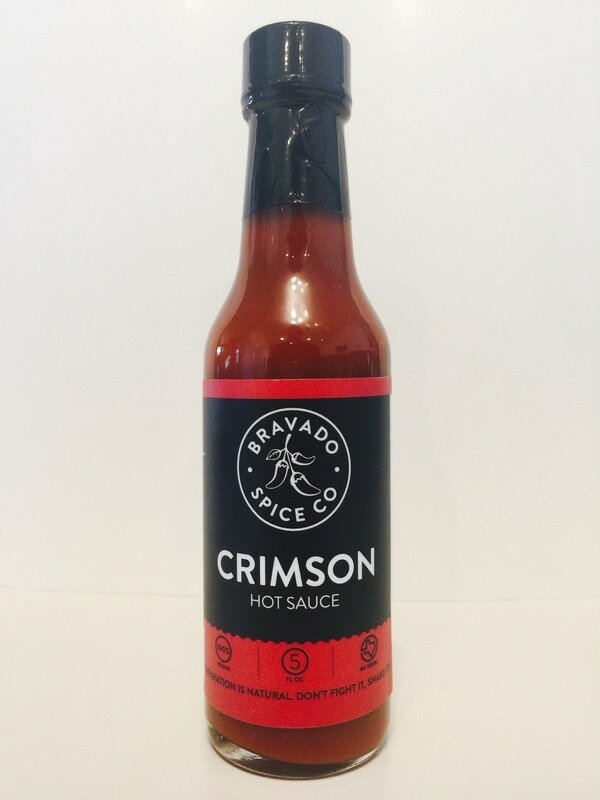 ​CRIMSON from BRAVADO SPICE CO... The arbol chili pepper and the red jalapeno blend together perfect to give this sauce a fantastic out front pepper taste. The addition of vinegar, garlic, sea salt and sugar (I really don't get any sweetness), makes this a terrific sauce. This is bursting with boldness that makes this bottle one to keep right on your table. 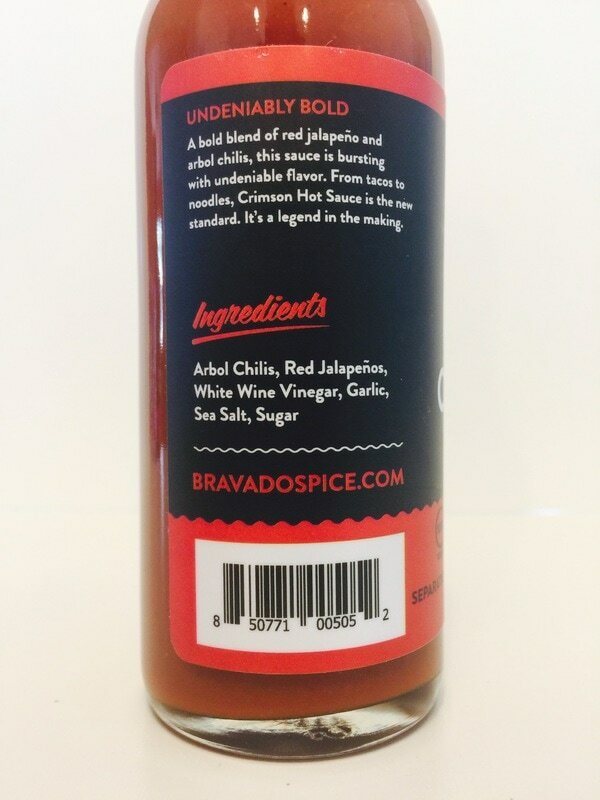 I feel this is Bravado's best all around hot sauce. Use on pizza, chicken, fish, breakfast, Mexican food or anything that you like to add heat. this is a outstanding sauce with amazing flavor. GREAT JOB!! 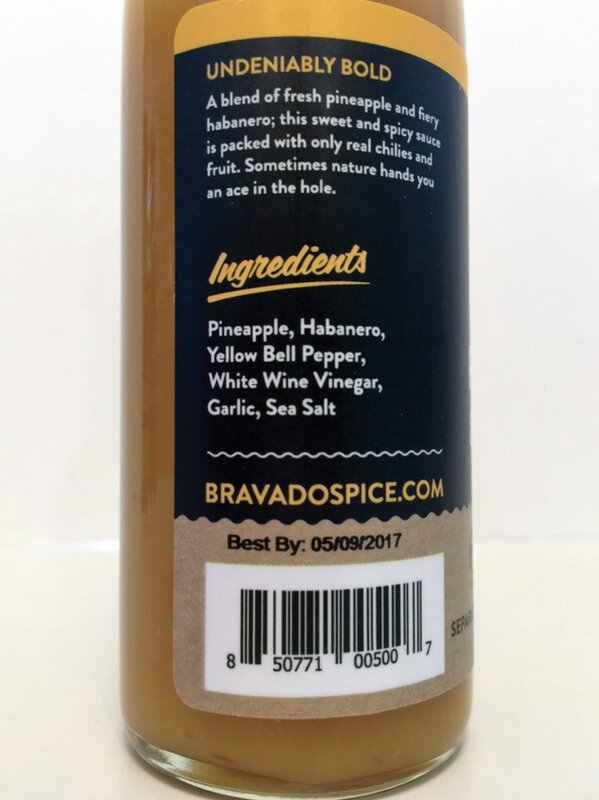 PINEAPPLE & HABANERO from BRAVADO SPICE CO... 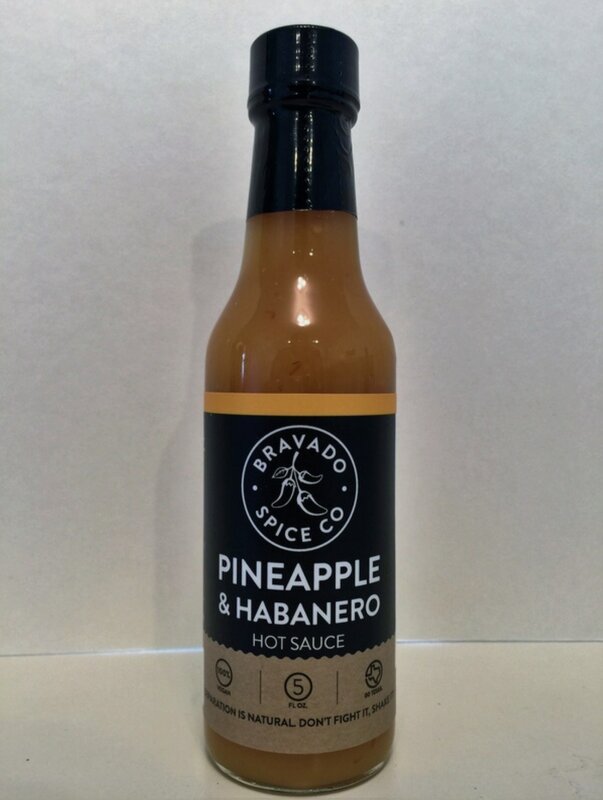 The name of this hot sauce tells you all about the flavor, pineapple with a habanero kick! You'll also get a hint of garlic with a splash of vinegar. What a refreshing tasting hot sauce that's not too heavy or over powering, but still bold with a fresh pineapple flavor. This sauce is great on pulled pork, used as a grilling glaze or poured over chicken, fish or even added to your Hawaiian style pizza. I even put it on cottage cheese, and it was amazing! 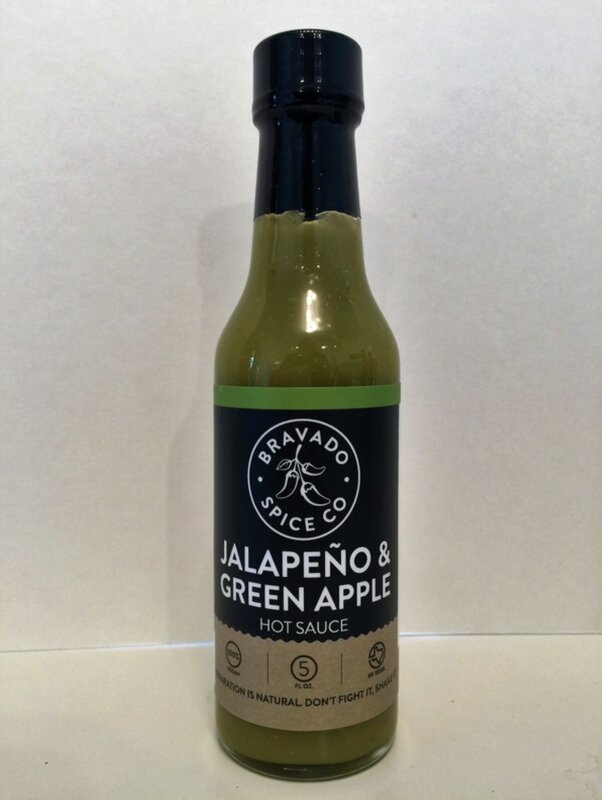 JALAPENO & GREEN APPLE from BRAVADO SPICE CO... 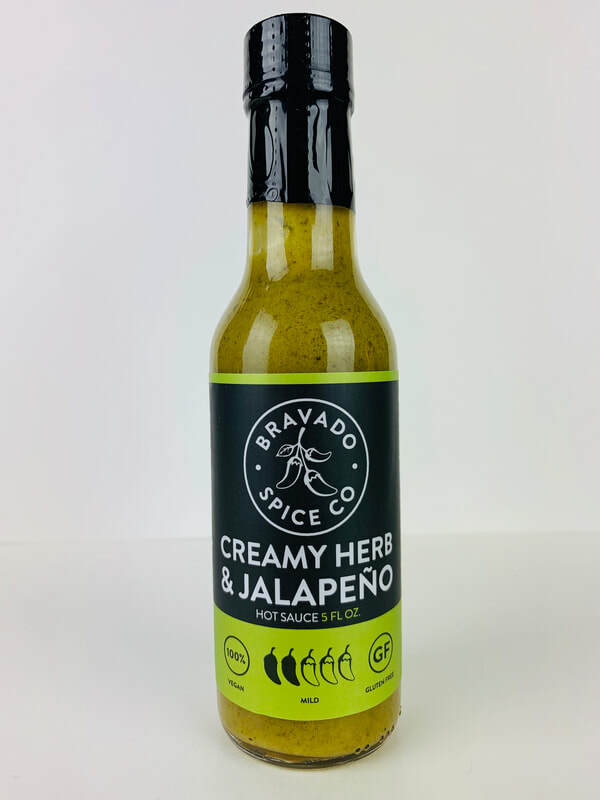 Here is a mild sauce from Bravado Spice Co. that starts out with the great flavor of fresh jalapeno, and at the end you get a slight green apple flavoring that cools the bite. Also you get a bit of garlic and vinegar mixed in with every bite. I used this on stake and eggs and it was awesome! This is great on fish, burgers, any type of tacos and BBQ. You'll definitely like the smooth flavor this sauce brings to your table. GHOST PEPPER & BLUEBERRY HAS BEEN RE-RELASED TO BE A SMOTHER TEXTURED SAUCE WITH THE SAME GREAT FLAVOR YOU HAVE COME TO LOVE! 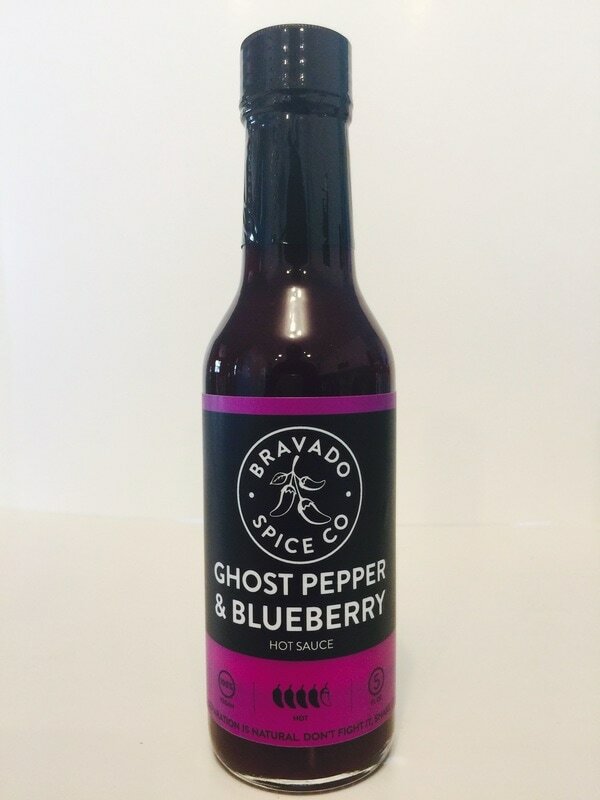 ​GHOST PEPPER & BLUEBERRY from BRAVADO SPICE CO... This is Bravado's hottest one and it's also bursting with flavor. You can see the blueberry's and along with their delicious flavor you get the black pepper and again that slight vinegar taste. 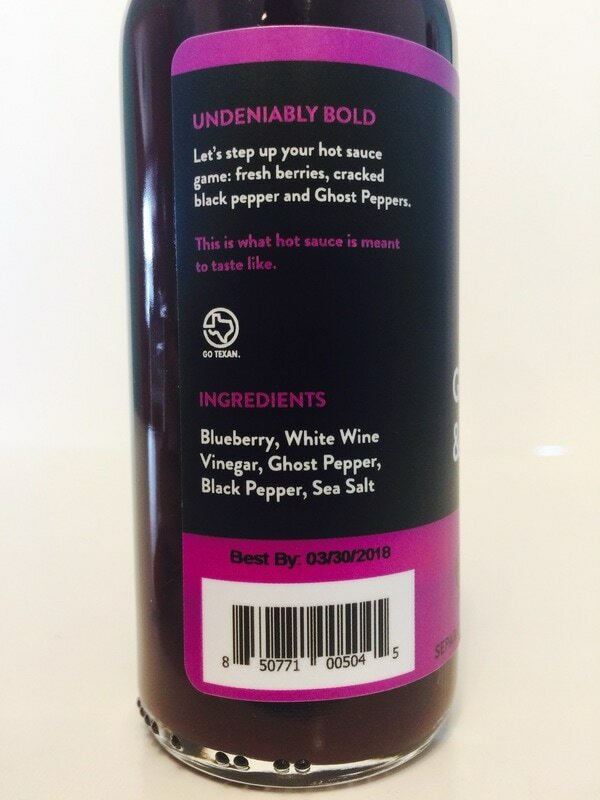 But don't forget the unique flavor of the ghost pepper that blends nicely with the fruit. This is great on steak, chicken, pork and BBQ.